On this day in 1944 possibly one of the greatest escape attempts by POWs occurred near Cowra, News South Wales, Australia. It was the largest prison escape of World War II, as well as one of the bloodiest. During the ensuing manhunt, four Australian soldiers and 231 Japanese soldiers were killed. The remaining escapees were captured and sent back to prison. By August 1944, there were 2,223 Japanese POWs in Australia, including 544 merchant seamen. There were also 14,720 Italian prisoners, who had been captured mostly in the North African Campaign, and 1,585 Germans, mostly naval or merchant seamen. Although the POWs were treated in accordance with the Geneva conventions, relations between the Japanese POWs and the guards were poor, due largely to significant cultural differences. A riot by Japanese POWs in New Zealand, in February 1943, led to security being tightened at Cowra. Eventually several machine guns were installed to augment the rifles carried by the guards, which was composed mostly of old or disabled veterans or young men considered physically unfit for frontline service. 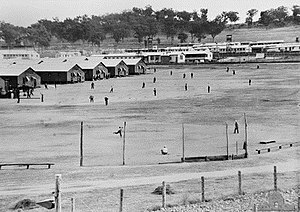 In the first week of August 1944, a tip-off from an informer at Cowra led authorities to plan a move of all Japanese POWs at Cowra some 400 km to the west. The Japanese were notified of the move on 4 August. At about 2 a.m. the following night a Japanese ran to the camp gates and shouted what seemed to be a warning to the sentries. Then a Japanese bugle sounded. A sentry fired a warning shot. More sentries fired as three mobs of prisoners began breaking through the wire, one mob on the northern side, one on the western and one on the southern. They flung themselves across the wire with the help of blankets. They were armed with knives, bats, clubs studded with nails and hooks, etc. Within minutes of the start of the breakout attempt Privates Hardy and Ralph Jones manned the No. 2 Vickers machine-gun and were firing into the first wave of escapees, but they were soon overwhelmed by the sheer weight of numbers and killed. However, Private Jones managed to remove and hide the gun’s bolt before he died. This rendered the gun useless, thereby preventing the prisoners from turning it against the guards. 359 POWs escaped. Some prisoners, rather than escaping, attempted or committed suicide, or were killed by their countrymen. Some of those who did escape committed suicide, or were killed, to avoid recapture. All those still alive were recaptured within 10 days of the breakout. On this day Harry Houdini, world famous escape artist, also performed a rather commendable escape. Houdini’s second variation on Buried Alive tests was an endurance test designed to expose mystical Egyptian performer Rahman Bey, who had claimed to use supernatural powers to remain in a sealed casket for an hour. Houdini bettered Bey on August 5, 1926, by remaining in a sealed casket, or coffin, submerged in the swimming pool of New York’s Hotel Shelton for one hour and a half. Houdini claimed he did not use any trickery or supernatural powers to accomplish this feat, just controlled breathing. He repeated the feat at the YMCA in Worcester, Massachusetts on September 28, 1926, this time remaining sealed for one hour and eleven minutes. Houdini believed that his experiment could serve as an example for miners who were trapped in shafts with limited oxygen. He said that it was important not be overwhelmed when faced with a lack of oxygen. “The important thing is to believe that you are safe, don’t breathe deeply and don’t make any unnecessary movements,” he remarked. The underwater coffin experiment would be Houdini’s last great escape. The famed magician died two months later, on Halloween, from peritonitis due to a rupture in his appendix. He suffered the injury when a McGill University student named J. Gordon Whitehead punched him in the stomach to test his abdominal muscles.